Love Sculpture with a hand sculpted fully 3 dimensional heart. We have designed the Custom Font for the letters so each letter molds or continually touches the letters on each side. Made from Walnut on a Walnut base. Each piece is custom made from one sold piece of wood. No two are alike. 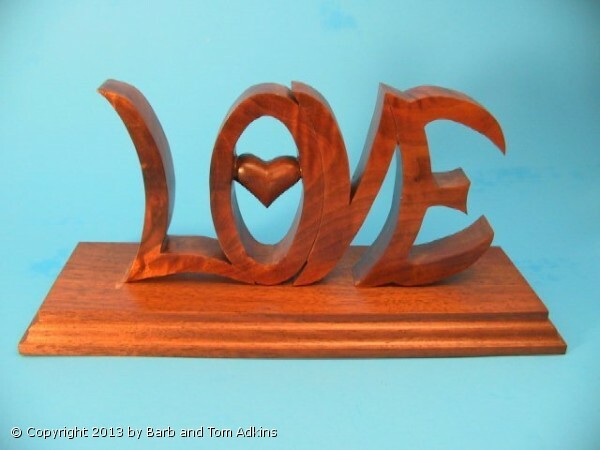 The LOVE has been carefully hand cut with a scroll saw. Each section is cut separately by stopping the saw and taking the saw blade out of the saw and inserting the blade into a new area of the wood. A tiny hole must be drilled into that individual section of the wood first, then the blade can be inserted into that hole to start the cutting of that area or section of the piece. After all the cutting is done each area must have all the edges carefully hand sanded and rounded. For 50th Anniversaries, we have also made a heart with a 50 cut above the heart. Tom can do this with any number to represent any anniversary year, ex. 10, 25, 35. This would be a wonderful hand made gift for Weddings, Anniversaries, Valentines Day, or Birthdays on that special day in their life. We also make mini pins or necklaces of this piece. See below. -You may choose whether to have the Heart painted red. Initials may also be added. This can be made larger for wonderful display piece.